Yomi ( 黄泉 ) is a new folk death metal band from Riga of Latvia. They were formed in 2013, but after several line-up changes and music re-directions, they split up for a year. In 2014, two of their initial members, Khurr and Isaz, resurrected the band and with a refreshed line-up they released the demo “Age of the Gods” in the beginning of 2015. The band decided to re-record the demo, adding two new tracks and self-released it officially as its debut full-length album on September 2nd 2015. Yomi is from Latvia, but their music is deeply inspired and influenced by Japanese oriental folk music, thus they call their style Japanese folk metal. “Age of the Gods” includes 10 songs with a total duration a little less than 36 minutes. Their music is a mixture of mid-tempo death metal with traditional Japanese acoustic instruments. Their death metal is mostly rhythmic with a somehow raw sound, not very technical or melodic. The band leaves all the melodies to the oriental folk instruments, which luckily (for me) have a quite dominant part in their orchestrations. For now they use mostly stringed traditional instruments, which add a really unique color in their music! I hope in the future they will add more instruments in the mix. Vocals are mainly brutal death metal growls, with only a few clean backing vocals. In my opinion a bigger variety in the vocals would make the whole project more interesting. While the production still needs a lot of work, Yomi have managed to balance their influences in a quite coherent result, something not easy at all, considering the huge differences between the styles they mix. All their lyrics are in English, with only a few verses in Japanese language. Of course the lyrical concept is around epic themes, Japanese mythology and history. “Age of the Gods” is a very interesting and promising debut from a young band. Despite some flows, I recommend Yomi to all fans of folk death metal. I still believe they need a lot of work, especially in the death metal parts, but on the other hand there are many brilliant moments in the album, like the parts when the Japanese traditional instruments take the lead, creating some wonderful instrumental oriental metal passages. They will soon start recording their second album, so I will definitely keep an eye on them. 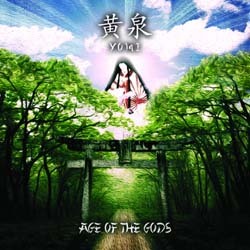 “Age of the Gods” is self-released by Yomi in a standard jewel-case edition CD with a 12–page booklet including all the lyrics and very beautiful illustrations, made also by the band members (by Khurr and Tom in particular). You can visit the band’s official pages below for more details and sound samples.